I’ve been on several mission trips in my life, and typically the last day is devotd to a process called “re-entry” – where participants some time debriefing in preparation for acclimation back into real life. On a mission trip, time is usually spent discussing how one might react to the newfound awarenss of the excesses and privilege in their first-world life. One might be warned of the culture shock they may experience, the discomfort they may feel returning their current lifestyle, and the importance of assimilating new learnings into effective life change that lasts beyond the trip. I’m feeling like I need a re-entry debriefing. Only, in many ways it is exactly opposite of debriefings I’ve needed in the past. This weekend was full of excess – it was an alternate universe where my time was my own. Remember my post about trying to add a little hedonism to my life? Yeah, I got that this weekend. 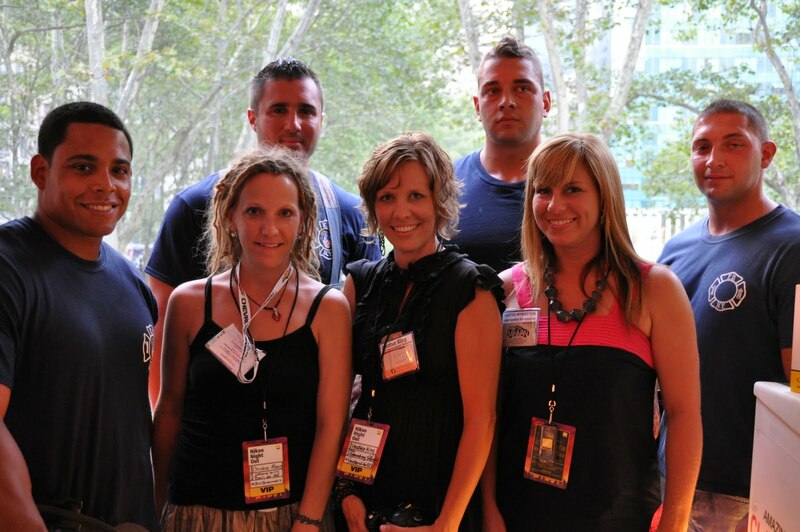 I have so much to say about the madness that was Blogher. It was stressful, it was a blast, it was exhausting, it was humiliating, it was affirming, it was inspiring. There were moments when I felt like I was validated as a writer and propped up by a community of my peers. There were moments when I felt like I was surrounded by a collective body of some of the smartest women in our country. And then there were moments where I felt like I was a thirteen-year-old who was too insecure to walk from the lunchtable to the bathroom without a friend on my arm. But now, I find myself wondering how one returns from a weekend like that to the daily grind of laundry, diapers, and bedtime routines. Who is going to leave swag on my bed? Who is going to invite me to a penthouse party? Where did the free food and drinks go? Where are the NY Fire Department calendar models who are being paid to talk me up at a party? (Clearly I was very bothered by this). This weekend brought up a whole mess of feelings, and entitlement is one that I am trying to squash. Because I met a lot of amazing, smart, and talented women. But I also met a lot of entitled women. Women who seem to have forgotten that this little blogging world is not real life, and that nobody owes us anything, and that all of this free stuff or noteriety or wooing by corporations is not going to make us better wives, mothers, or writers. Even if we do have an “engaged and growing audience”. More on the “blogger as celebrity” bit later. But I will say, I noticed a converse relationship between Women Who Acted Like Divas (a small minority, really) and Women With Legitimate Writing Chops. I also noticed that Ree Drummond spent some serious time just standing approachably in the lobby, chatting with whoever wanted to talk to her. But I’m giving too much away. That is a post for another time. As I sort through my reaction to this conference, there are a lot of aspects I want to diminish, but a couple I want to take home with me. The first is community. There was a really strong sense of community. Diversity was hugely valued here, from physical disability to religion to race to sexual orientation. On a broad scale, it felt supportive and accepting. It really made me long to spend more time with my own friends. Having time away from daily responsibility is such an amazing way to connect with other people, and I probably had some of the most meaningful conversations I’ve had in a long time. I also had FUN. It was so great to really let loose and be spontaneous. Dancing on the stage at Sparklecorn? Sure. Heading out to Karoake at midnight? Okay. Walking around times square with no intentions? I’m in. Sing on stage in an impromptu Annie flashmob? OF COURSE. I felt like I found a side of myself that has been dormant for a very long time. I felt the trauma of the last year loosen it’s grip a bit. I laughed. A lot. That felt good. I also feel like I am walking away from this weekend inspired to be more creative. 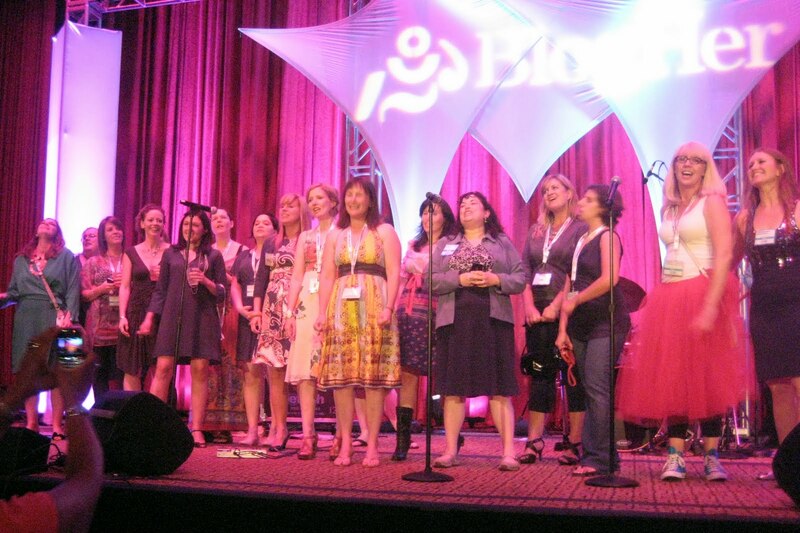 The community keynote at Blogher featured thirteen women whose posts were chosen as the best of the year. We laughed, we cried . . . but mostly we marvelled at the way these writers crafted a story. I also got the chance to see three plays while I was in New York – all of them amazing and creative in their own way. All of it left me pondering the beauty in creating something that touches others. And behind all of thefun and silliness and drama of this conference, this is what I want to take away. . . a desire to create. I’ve been in a fog and I’ve been ignoring that aspect of myself, because it has seemed superflous. Optional. Self-indulgent. This weekend was a reminder that creativity is vital. So, I fly home today, ready to kiss my kids, to be more engaged, and to pay more attention to nurturing my creative side. And yes, the hotel we are living in will never be as glamorous as the Hilton, and I won’t have four parties to choose from tonight. But that’s gonna be okay.